There are two things that have become essential to my weeknight cooking repertoire: ease of preparation and getting my daughter to eat it. On the first point, contrary to what you may think of me, I am not a huge planner when it comes to dinner. At least not like I used to be. But even when I had more time to plan, shop and prepare (and I even threw an occasional dinner party) I still mostly decided what to cook an hour before serving it. I get that the planning is half the battle and I know people who plan out their meals for the whole week on Sundays. But for me that's hard because I don't know how I am going to feel on any given day. It's not because I am not organized or don't like to be efficient. I see the need, especially with kids, to be both of those things and, like anyone else, my time is now more crunched. But I like to be spontaneous with food. I like to eat what's in season or what looks good that day at the store and just go with my mood on any given day (which also includes ordering take-out or going out once in a while). Also, my moods change weekly, if not daily, for what I feel like cooking and eating. I might see a magazine photo that catches my eye and get excited about trying it. Or I might go on a meat kick or a healthy vegetarian kick or any number of things. And I'm always trying new recipes. Like this one for spiced sweet potato and roasted broccoli toasts which blew my mind recently. (Recipe link to bonappetit.com). I saw it, I wanted it, I thought June would eat it because broccoli and sweet potatoes are two veggies she's always loved (I was wrong), so I made it. I left out the red chile in the sweet potato to make it kid-friendly and replaced pistachios with peanuts and almonds since that's what I had in the pantry. I'll make them again because they were so good. And if I keep trying, I may just get June to eat them. But back to my second point. Also contrary to what you may think (and to everything I expected), I have a child who is a "picky eater." At least she is right now. It's just a phase, I know, and a completely normal one for a 3-4 year old, as far as I can tell. And it kills me. I love food, I love to cook, I cooked my own baby food, I had her eating charcuterie plates in high end restaurants when she was 18 mos old. And yet, these days I can hardly get her to eat the (mostly) delicious home-cooked meals I put on the table. She loves carbs: pasta, bread and pizza, and sweets of course, but getting her to eat her protein and her veg or --God forbid, a curry or beef empanada--you'd think I was torturing her. So our rule of thumb now is keep putting delicious, healthy, home-cooked food in front of her and don't make a big deal out of it (don't fight, don't cajole, no bribes for dessert) and either she eats or she goes to bed hungry. No special meals or substitutions will be made. Out of pure stubbornness she has gone to bed with hardly any dinner on more than a few occasions lately. (By the way, if you have a "picky eater" right now too, this blog/experiment on the NYTimes parenting site has some useful tips). Who doesn't love a simple roasted chicken? And who doesn't need a quicker way to prepare one? I used to brine, salt, truss, rotate, stuff with all kinds of herbs and pastes back in the days before I had June. And then in the last year or so found myself picking up a rotisserie bird from the local market and throwing together a few sides on busier days. But those store-bought birds are not only not good quality chickens, they are almost always dry and flavorless. This Cook's Illustrated "Weeknight Roast Chicken" turned that around --and made a happy if slightly cave-girl-like eater out of June last night. For the first time in a long time, we had no mealtime battle, we talked about something other than what she was or wasn't eating, and we all licked our fingers it was so moist and flavorful. Buy a 3 1/2- 4 lb good quality chicken (such as Springer Mt. Farms). Pre-heat oven to 450 degrees, placing a 12-in ovensafe skillet on middle rack. Rub chicken all over with olive oil. Pat chicken dry and season all over with salt and pepper (If I have time or think of it, I do this an hour in advance to give the skin a chance to air-dry (in the refrigerator of course) and the seasonings to soak in but it's not necessary). 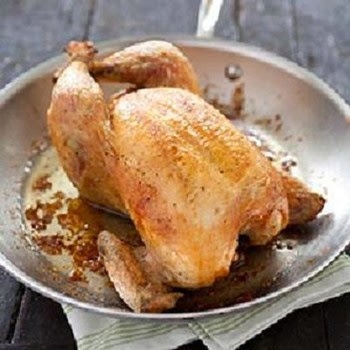 Take chicken out of fridge at least 30 min before roasting as a cold bird will cook unevenly and throw off cooking times. Transfer chicken, breast side up, to heated skillet in oven. Roast until breasts reach 120 degrees and thighs 135, about 25-30 min. Then turn down oven to 325 and continue to cook until done, about 25 more minutes *(160 degrees for breasts, 175 for thighs). Remove chicken, let rest for 20 min before serving. *Note: This high oven to low oven temp process achieves a nice brown skin, with really tender and moist breast meat and perfectly cooked dark meat. The C.I. version has you turning the oven off after the first 30 min and continuing to cook as the oven cools down, slowing the evaporation of juices. My oven not being that precise, I was afraid to do this so I turned it down instead and I think the result was just as good. As always, use a good thermometer as times may vary so check your chicken and err on the side of less, not more time, remembering that temperatures continue to rise when chicken is resting. Carve chicken and serve-- and watch the happy faces at your table.